I have been trying to add more treats to my Christmas repertoire and I chanced upon a cake that used sugar beet and I thought to myself – why not try to make some bread or cake using it. 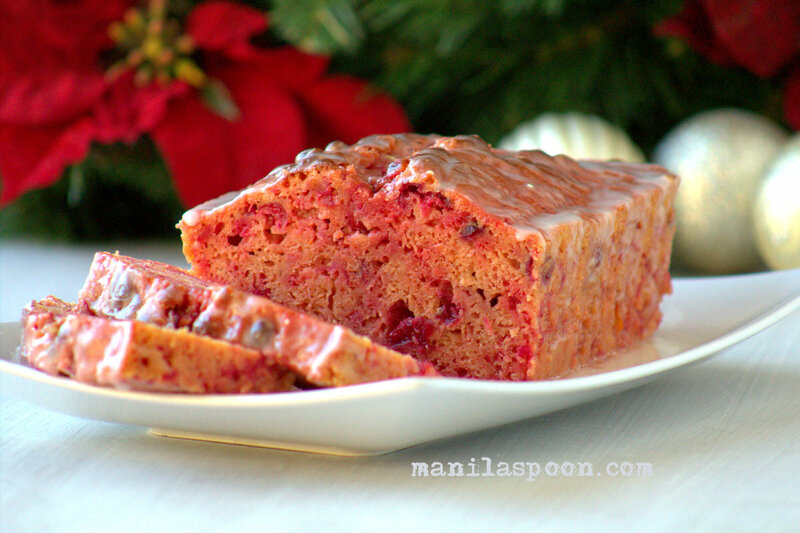 Since red is one of the colors of Christmas then it’s great to use Beet to give a vibrant red color to a cake or bread. After all sugar beet is an all natural food coloring. And, it’s naturally sweet, too. While not everyone fancies a beet (I was once on a beet diet – not for losing weight but to improve my health a little) because it has a funny, earthy (like soil to put it bluntly…) taste, I thought it’s worth a try. I just need to figure out how to tone down the taste of the beet so it doesn’t overpower the other ingredients and become unpalatable (as am sure just the idea of having beet in cake would turn off some!). So I thought adding some citrus flavors would help. I have read some recipes that use lemons with sugar beet – it helps temper the flavor of the beet without necessarily eliminating it. I want a slight taste of the beet – just that – slight but with some hint of sweet-tangy and juicy goodness coming from the citrus fruits as well. Of course, talking about tangy flavors, I added fresh cranberries to the mix to help improve the taste too! Every bite with the cranberries truly make it divine. Also, as you will notice I did not add any butter or oil in making it (perhaps that’s the reason why it’s denser than your usual cake/bread) but with the sour cream/yogurt and the beet themselves (not to mention the few tablespoons of citrus juice) providing enough moisture to the loaf – I felt it was unnecessary to add additional fat. After I have baked and tasted the loaf – I can confirm that additional oil or butter was not essential. The loaf came out moist and quite flavorful, too. Just some additional observation – for my first attempt – I used a large beet – about 1 cup or so of grated beet (you should have seen my hands after grating them!) and I must say, if you are not a beet lover you may want to use a smaller beet….and that’s what I’d do for the next time – am pretty sure, I’ll still achieve the red color (or perhaps pink) but without the strong beet taste. I added some Lemon Glaze to drizzle on top – don’t omit this – it makes the loaf taste even better. I already like it without it – but the lemon frosting just brought an extra dimension or another level to the taste. Believe me, my kids finished the loaf in no time – they weren’t bothered by the beet taste – I think the orange (which I used for this) and lemon (for frosting) masked the beet taste so well, too. Finally, I don’t know if I should call this a Cake or a Bread. It is in a loaf form for sure – and I have made Loaf cakes before (like my Portuguese Orange Cake – but that one has a true cake texture). This Loaf albeit moist is denser and a little heavier than a regular cake so perhaps it’s more of a bread. You be the judge. I will just call it a Christmas Loaf – owing to its color and because I made it during the holidays, deal? *You may wish to use some food preparation gloves (like vinyl) when peeling and grating the beet unless you don’t mind having “blood red” hands. *My husband suggested that for next time, I add another 1/4-1/3 cup of cranberries ’cause for him it needed more. He wanted to see more speckles of cranberries and wanted more of their tartness to shine. I will surely try this next time. Preheat the oven to 350 F/ 180 C. Lightly grease a 9 x 5 loaf pan (preferably a light-colored one) with a cooking spray. In a large mixing bowl, combine all the dry (flour, sugar, baking powder, salt and spices) ingredients. Set aside. In a mixing bowl of a stand mixer, beat the eggs with the sour cream or yogurt just until combined. On low speed, add the grated beet and zest and juice of either the lemon or orange (whichever you prefer). Mix just until combined. Add the wet ingredients to the dry. Mix well. Fold in the chopped cranberries. Spoon or pour (whatever…) the mixture to the prepared loaf pan. Bake for about 60-65 minutes or until a tester comes out clean. If after 45-50 minutes and the top is browning a bit, just cover it loosely with a foil and then continue to bake until it’s fully cooked. Let it cool fully in the pan before you turn it out onto a wire rack or before wrapping it for storing. I took it out of the pan after it has fully cooled down (that ensures that it will not break apart). It can be made up to three days ahead – just wrap it – cling wrap or parchment paper and then store in an airtight container. As with any bread if you leave it out, it will dry out so store it properly. Place the powdered sugar and lemon juice in a mixing bowl. Beat until it reaches a smooth and pourable consistency. Easy! Once the loaf has cooled down or let’s say you were patient like me and waited till the next day – then make the glaze and drizzle all over the loaf. Yes, use the entire glaze on the loaf. Enjoy with a cup of fruity tea. If you like what you see and would like to receive new recipe updates, feel free to subscribe to our posts or join our site and like us on Facebook. Happy browsing! Hi Sessy! Yes, I was amazed when I tried it too and most of all my kids loved it – they didn't mind the beet taste at all. Perhaps because of the lemon glaze! 🙂 Thanks for stopping by! Awwwww! Chloe and Sarah – you are both so kind and generous to give me such an honor. Thank you very much! Thanks, Sara! Sure we'll check out your blog! This looks awesome. Thanks for sharing on Foodie Friends Friday. Thanks, Marlys! Love sharing on Foodie Friends Friday! G'day Abby! This looks wonderful, true! I now have this on my list to do too! Thanks for the great hint and tip too! Thanks, Joanne! It's quite unique that's why I love it. Please enjoy!